The 13th International Scientific Conference HBSM-2018 «Hole Burning, Single Molecule, and Related Spectroscopies: Science and Applications» was successfully held by the Moscow Pedagogical State University (Department of Theoretical Physics of E.V. Shpol’skii) and the Institute for Spectroscopy of the Russian Academy of Sciences (ISRAS) from August 6 to 10, 2018 in Suzdal, Vladimir Region and August 11 in Moscow. Head of the Organizing Committee of the Conference was Andrei V. Naumov — Head of the Spectroscopy of Condensed Matter Department of the ISRAS, Professor of the Russian Academy of Sciences. Scientific secretary of the conference was Kamil R. Karimullin – PhD in Physics, Senior Researcher of the ISRAS. 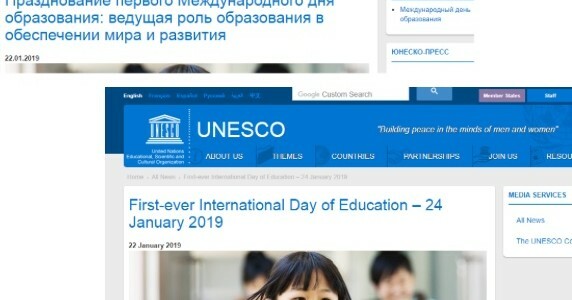 Students and graduate students of the Moscow Pedagogical State University, the Moscow Institute of Physics and Technology and the Higher School of Economics as well as ISRAS staff took part in the conference organization. 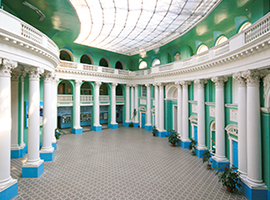 Official website of the conference: hbsm2018.ru. 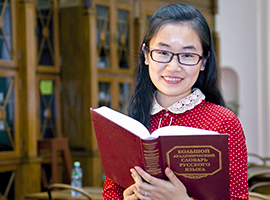 Laser selective spectroscopy has a particular significance and value for the Russian scientific community. The emergence of quasi-linear spectra of complex organic compounds in specially selected solvents at low cryogenic temperatures known as “Shpol’skii matrices” was first observed in 1952 by Prof. Eduard Shpol’skii’s group from the Department of Theoretical Physics of the Moscow Pedagogical State University. 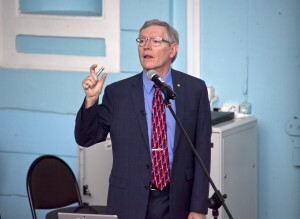 In 1972, a former student of Prof. Shpol’skii, Prof. Roman Personov, and his colleagues at the Institute for Spectroscopy of the USSR Academy of Sciences demonstrated successful site-selective laser excitation of narrow luminescence spectra in organic molecules. Two years later, in 1974, Personov’s group with their colleagues from the Institute of Physics in Tartu, Estonia (USSR) conducted the fundamental experiments on the persistent spectral hole burning. That work had formed the basis of laser site-selective spectroscopy of molecules which has now evolved in single-molecule spectroscopy. HBSM was known under a few different names. It started in 1987 in Tallin, Estonia (USSR) as “All-Union Symposium on Modern Methods of Laser Spectroscopy of Molecules in Low-Temperature Media”. The second meeting took place in Monterey (California, USA, 1991) as “Persistent Spectral Hole Burning: Science and Applications” while the third became “Spectral Hole Burning and Luminescence Line Narrowing: Science and Applications” and moved to Ascona (Switzerland, 1992). Later it was organized as “International conferences on Hole-Burning and Related Spectroscopies (HBRS): Science and Applications” in Tokyo (Japan, 1994), Brainerd (Minnesota, USA, 1996) and Hourtin (France, 1999). In 2001, the conference finally found its current name “Hole Burning, Single Molecule, and Related Spectroscopies (HBSM): Science and Applications”. It paved its path through Taipei (Taiwan, 2001), Bozeman (Montana, USA, 2003), Aussois (France, 2006), Palm Cove (Australia, 2009), Tübingen (Germany, 2012) and Tartu (Estonia, 2015). This conference series has been exceptionally successful in bringing together participants from the leading research teams around the world to discuss the latest development in the fundamental science and the applications of site-selective and single-molecule spectroscopy and related topics. «Photoinduced phenomena in solids». 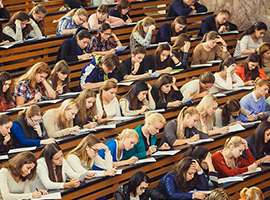 Issues related to selective laser spectroscopy, spectral holes burning, photophysics of biomolecules and molecular complexes, photon echo and ultrafast processes, optical dephasing and spectral diffusion were considered. «Single nanosystems and nanooptics» included the following topics: spectroscopy of single molecules and nanoparticles; single biomolecules and quantum dots; single ions and color centers in solids and nanocrystals; nanoscopy; near-field spectroscopy and nanoplasmonics; nonlinear optical effects. «Functional nanomaterials» was devoted to optical markers, organic and inorganic systems, photovoltaic applications; hybrid systems; Sensors based on single molecules and nanoparticles. «Optical signal processing and quantum technologies» presented researches in quantum information in condensed phase, time and space domain holography, on-chip technologies, novel spectroscopic techniques and instruments. The plenary speakers of the conference were world-class scientists: Nobel Prize winner in chemistry in 2014, Professor William E. Moerner (Stanford University) and laureate of the most prestigious international prizes, Professor Michel Orrit (University of Leiden). 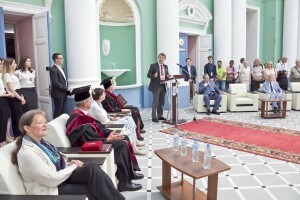 Plenary lectures of W. Moerner and M. Orrit took place at the Main building of the University after the solemn ceremony of conferring the title of «Honorary Professor of the Moscow Pedagogical State University» to the scientists on August 11. The poster section and the scientific reports competition were organized for the young participants of the conference. Professor Ivan Scheblykin (Lund University, Sweden) was the head of the jury. 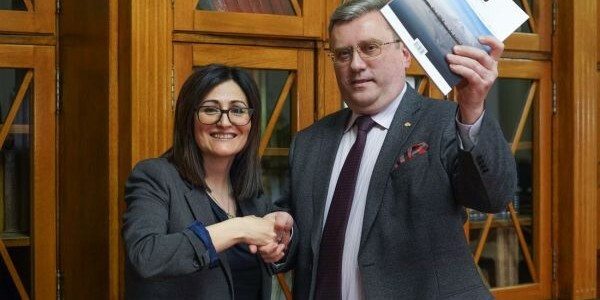 As a result of the competition for the best report, Andrey Anisimov (Ioffe Institute of the Russian Academy of Sciences, St. Petersburg) was awarded with the diploma and money prize. With the support of the European Physical Society one more event for young researchers was organized in the «round table» format. Due to active participation of the young minds section of the EPS («Moscow Pedagogical State University Young Minds Section», the president of the section is Artem Arzhanov — Master of the Moscow Pedagogical State University, Engineer of ISRAS) young scientists had an opportunity to ask leading scientists questions that concern them in an informal setting. Professor Alexei Vladimirovich Lubkov, the rector of the Moscow Pedagogical State University, and professor Viktor Zadkov, the director of ISRAS opened the conference with welcome speech. 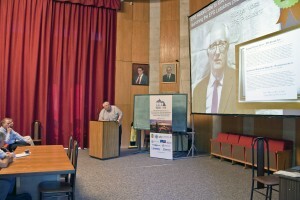 The grand opening of the conference was marked by the awarding of the Shpol’skii-Rebane-Personov Prize, which was established this year by the Institute of Physics of the University of Tartu (Estonia), the Institute for Spectroscopy of the Russian Academy of Sciences and the Moscow Pedagogical State University. 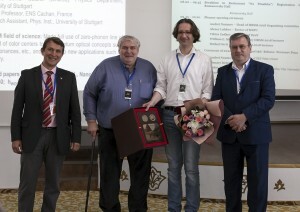 The first Shpol’skii-Rebane-Personov medal and prize were awarded to Professor Fedor Jelezko (Ulm University, Germany) for the quantum optics experimental investigations of the single molecules and NV centers in diamonds and their applications for magnetometry and quantum informatics. 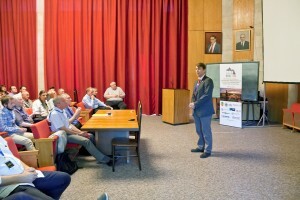 After the ceremony of awarding, Professor Jelezko gave a plenary lecture «Diamond based Quantum Technologies». 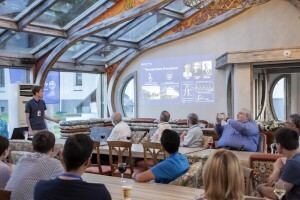 On August 11, the conference participants were invited to the Institute for Spectroscopy, where a special historical section dedicated to the 50th anniversary of ISRAS was held. The guests were greeted by the chief executive of the city V.E. Dudochkin. The director of ISRAS V.N. 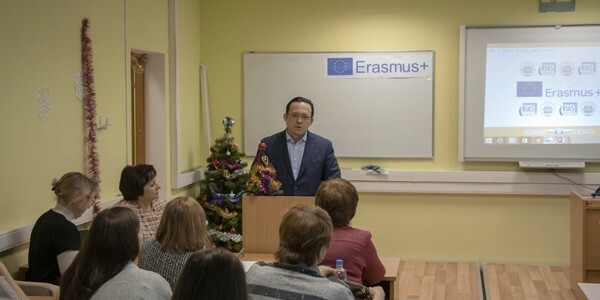 Zadkov gave a speech about the history and present activities of the institute. Short scientific reports were made by Professor E.A. 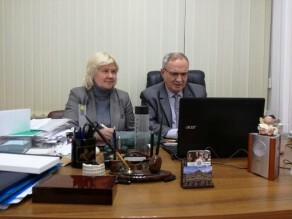 Vinogradov and Professor V.M. Agranovich. 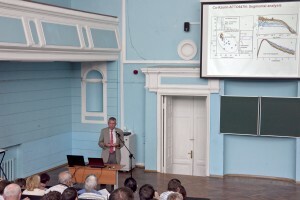 Former colleague of the Institute Boris Kharlamov shared his recollections of the first works on selective laser spectroscopy carried out at ISRAS under the guidance of Professor R.I. Personov. 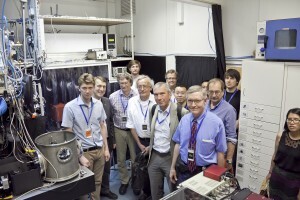 HBSM participants visited laboratories of the institute. At the close of the HBSM-2018, William Moerner thanked the organizing team headed by A.V. Naumov for the high level of the conference. 144 participants from 17 countries took part in the conference HBSM-2018 (Australia, Belarus, Belgium, Germany, Denmark, India, China, Netherlands, Poland, Russia, Serbia, USA, France, Switzerland, Sweden, Estonia, Japan). The scientific program of the conference included 3 plenary lectures, 19 invited, 34 oral and 41 poster talks (in total of about 200 co-authors from 116 organizations from 21 countries). According to the decision of the international program committee, the next conference » Hole Burning, Single Molecule, and Related Spectroscopies: Science and Applications» (HBSM-2021) will be held in Banz Castle (Bad Staffelstein, Bavaria, Germany) in 2021.